American Croquet is played between two sides - the blue and black balls versus the red and yellow balls. In singles each player plays two balls; in doubles each player plays the same ball throughout the game. The object of the game is to maneuver the balls through the course of wickets and into the stake, as shown. The side which first does so with both its balls wins the game. Play is made by striking a ball with a mallet. 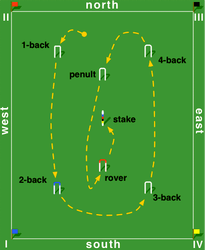 The player who is playing a turn is called the striker, and the ball in play for that turn is the striker ball. Turns are played in the sequence blue, red, black, yellow, and so on throughout the game. This sequence of colors is usually painted on the stake. Each turn is initially one stroke, but extra strokes are earned when the striker ball hits another ball or scores a wicket point. By making good use of these extra strokes it is possible to score many points in one turn. The striker ball may cause other balls to move and score points. However, the striker must never strike any ball other than the striker ball. The striker must play using the mallet only, and must not play a stroke while touching any ball with hand or foot. The striker must strike the ball with one of the mallet's two striking faces, never with a side face or the shaft. 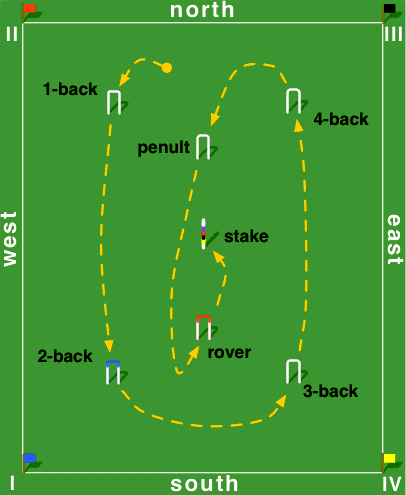 The striker must strike the ball cleanly and only once during the stroke.To start the game, the winner of a coin toss chooses whether to play first with blue and black or second with red and yellow. Each ball is played into the game from the starting tee, starting with blue. A ball scores a wicket point by passing through a wicket in the correct direction and sequence. Each ball has a corresponding clip, used to show which wicket the ball needs to score next. For wickets #1 through #6, the clip is placed on top of the wicket. For the remaining wicket points, the clip is placed on the side of the wicket. At the start of a game, all four clips are placed on the top of wicket #1. If the striker ball hits another ball we say it has made a roquet, and the striker becomes entitled to play a croquet stroke. The croquet stroke is played by picking up the striker ball, placing it in contact with the roqueted ball, then striking the striker ball in such a way as to make both balls move. The striker ball is now dead on the other ball. The striker earns an extra stroke (called a continuation stroke) by scoring a wicket for the striker ball or by playing a croquet stroke, so long as no ball went out of bounds during that stroke. The continuation stroke is played as the balls lie. If the striker ball scores two wickets on one stroke, or scores a wicket during a croquet stroke, only one continuation stroke is earned. No continuation stroke is earned if the striker’s ball makes a roquet during a croquet stroke, the roquet requiring that the striker immediately play a croquet stroke.